She served in Taraba State. Ifeji described her experience in camp as the time of her life she would always relish. As a fresh graduate, she had thought that the regimented life in the camp, with soldiers keeping a watchful eye on corps members, would be stressful, but she was wrong. The experience was almost like nothing changed for the party-loving lady. “What made Club Zero interesting was because the soldiers in the camp usually let their guards down there, looking for free beer from the guys and willing girls to flirt with. Some soldiers were lucky enough to find drunk and vulnerable girls who would follow them to their quarters for 'private business'. “It was normal to see corps members in pairs, kissing, groping and doing s*xually suggestive things in Club Zero. The place was dimly lit so the atmosphere was conducive for certain actions. A day really stood out for me: people were shouting and I was wondering what could have happened. Then I realised that a guy and a lady had just been found having s*x in a corner at Club Zero. According to the NYSC Code of Conduct during the period of orientation, any member found to be drunk shall be tried by the Camp Court and, if found guilty, be liable to extra drill and/or confinement to the camp rehabilitation room for 30 minutes. “Only few people knew about the brothel; it was all in code. The bed and room were made available on demand. Once you paid, they would set it up and secure the place for you while you had fun with your partner. I didn’t find out about the price because I was never interested in it,” he told The Punch. “He used to sell cough syrups with codeine too so corps members who could mix their drinks with the drugs. Sometimes, you would see a guy in camp spending hours to finish a bottle of coke. 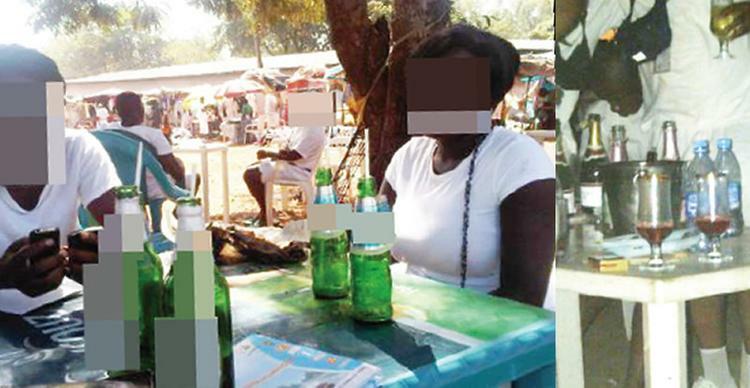 Some female corps members also patronised the guy, but the interesting thing is that the soldiers knew about it and would even joke with corps members misbehaving that they must have been buying too much of tramadol and codeine from the photographer,” he said. “In my platoon in the camp, I was deployed to serve in the sanitation unit for some time. And I had to clean up the parade ground. I was very irritated as I had to pick up many used cond-oms on the field. That was my duty post and the job had to be done. “Even me, I never thought I would smoke in my life but while I was in camp, I found myself smoking and doing things I would ordinarily not do,” he told The Punch.